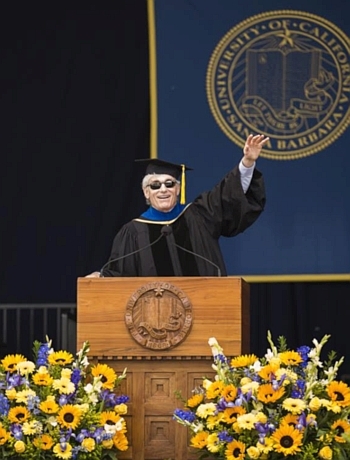 These remarks were given as part of my address to the graduating class of the University of California Santa Barbara in June 2017. If you folks like a good story, as I do – then try this: Think of your life as a story. My own story is one with an especially bizarre plot: lots of drama, excitement, struggle, surprise, and comedy. Growing up in Colorado, I always dreamed of becoming a writer. To live in a mountain cabin, writing books. My first novel had a terrific reception – rejected everywhere (32 times… but who’s counting?). Rejections hurt —but at least one was very personal: “Dear Sir/Madam”, with “Sir” circled. So I shifted to Plan B: I joined a business in New York City, and eventually became president. As the business grew more successful, I got more busy. Even so, I’d get up before dawn to write stories. Finally, I realized that life is just too short not to give this enduring passion another try. So I had the fun of shocking all my business partners and investors by quitting as president of the company. They thought I was completely crazy. That was 26 years ago – and 31 books ago. In that time, more good things have happened than I could have ever guessed: best sellers, international editions, and a movie in the works at Disney. People often ask me – was it scary to change careers? Sure, all change is scary. But the thought of trying and failing again wasn’t nearly as frightening as the idea of growing old, coming to the end of my life, and knowing that I had a big dream – but I never really tried to make my dream come true. That would be far worse than any nightmare. All we have – all we have – is our time and our souls. So why not make the most of them? As Buddha said: “Make of your life a light.” Not just for yourself – but also for the wider world. One reason I like to write fantasy fiction is not because it’s an escape from this world. Rather, it’s a powerful way to examine this world – to look at it more closely, through the bent mirror of imagination. As I often say – good fiction must be true. Not in a factual sense, but in an emotional and spiritual sense. That’s why fantasy fiction, set in an imaginary world, can tell us so much about ourselves and our world. That’s why I love a good story that’s a hero’s journey. A character we care about must rise above huge obstacles to survive… and also save his or her world. There’s real, honest struggle – conquering inner fears as well as outer foes. If done well, this kind of story is hopeful and uplifting. But that hope must be earned. Authentic. And thus truly heroic. Here’s an example: In my books set in Merlin’s magical land of Fincayra, or in my new trilogy on the mythic isle of Atlantis – there is growing peril. Despite all the inspiring beauty, deep wisdom, and magical creatures of those worlds… there is great evil from people who are greedy, selfish, divisive, and mean-spirited. Fortunately, there is also great heroism from people who are courageous, loving, compassionate, and generous. The stakes are high – the very future is at risk! By the way… do those fantasy worlds sound at all familiar? Do they remind you, by chance, of another world you know? You see, this kind of story is more than just a page-turner with high stakes. It’s also a metaphor for the place we call home. Whether it’s our world or an imaginary one, the point is the same: If wisdom and love are going to prevail; if the wondrous beauty of nature and wilderness is going to survive; if humanity, diverse cultures, and the great array of creatures are going to live together in peace – then it’s up to the people of those worlds. People of courage, perseverance, tolerance, and high ideals. And in our world… it’s up to YOU. What you do matters. What you say matters. What you choose matters. Despite our disagreements, we are all citizens here – citizens of our world. We all share common bonds – with each other, with this nation, and also with this planet. We all care about the future, and we must communicate better if we’re going to create that future together. So let’s talk to each other – and more importantly, let’s listen to each other. Also…the environment has been made (by some people who would profit from it) into a highly political issue. But clean air, clean water, healthy fisheries, wildlife, and parks benefit us all. These are not partisan issues! They are very important – to all of us now and to future generations. Everything I’ve said today boils down to this: Always remember that you are writing your own unique story – with every day you live and every choice you make. This is your story, set in your world – with your time and your soul – and YOU are the author. You will write every chapter – all the way to the end. Just make sure your story – like any good book or movie – has plenty of heart and humor. And some important ideas. Put all this together and you will have a truly meaningful life story! Now go tell your story with courage. Tell it with passion, love, and gratitude. Make it the most AWESOME story you can!